If you’ve spent time volunteering as a family with Sunbeam Kids or with other organizations, you already know how lending a hand is a win-win-win. You get to be together with family and friends, help others in need and improve your community (and beyond!). You probably know that for the most part, your children get the same benefits you do, but have you given any thought to the ways volunteering can help your children at different stages of development? You know that volunteering helps to foster a sense of empathy, confidence that they can make a difference and responsibility to be a kind member of the community, but how does that change by age as they develop? Let’s take a quick look at how volunteering can affect children of various ages based on what we've seen over the past five years. When volunteering with your younger children, they may not understand the details of the project, but with a little bit of conversation in the car on the way to the project to set it up in their minds, they know they are going to help someone and/or do something good. Through these hands-on project experiences, they start to learn compassion and empathy for others. Seeing that there are others around them who don’t have as much as they do will instill a sense of gratitude, even if they’re not yet able to express it in so many words. Or, being a part of a park cleanup where they hold a bag or use a fun “pincher” tool to help pick up trash helps them learn that they can be part of the solution. It may be slow going in terms of filling that garbage bag, but the learning is the key here. They get great joy and confidence from the positive reinforcement parents and others offer when they help. Also, being exposed to different kinds of people will teach them tolerance and patience. They’ll learn from an early age how important community involvement is, and they’ll see firsthand what a difference each person can make. They’ll also begin to develop a sense of self-efficacy, as they’re shown how to do certain tasks, then manage to complete them on their own. These skills are huge in developing their sense of self confidence. Building on the same concepts as discussed with the younger kids, volunteering with grade school kids can be fun and rewarding. Through school, sports, books and electronics they are starting to understand that there is a big world out there and they are curious about it. Volunteering together helps you are parents or caregivers shape the concept that they have a role to play in their community. Every day we each impact ourselves, our family and our community…and we choose whether that’s a positive impact, or not. When we show how great it feels to play a positive role, and then reinforce what a great job they did, it helps them want to do it more often in their daily lives. Parents can lead by example that even with work, sports games, band concerts, dance recitals, etc. that your family is a family makes time for helping others. Even if it’s a few times a year, kids pay attention to how parents prioritize their time. And projects don’t even have to be formal or big! Secretly shoveling a neighbor’s sidewalk before they get home from work or bringing dinner to someone who just had a baby or lost a loved one, both show your kids that you are not looking for thanks and praise, but are just looking to lighten someone’s burden. The great thing about this age is that they start to understand the social concepts and make a deeper connection to the project. While we keep things pretty light (and always neutral ground) at Sunbeam Kids projects, the kids of this age are starting to ask more questions of their parents. Discussion after the project starts to become more important to try to spark because they are absorbing bits and pieces of the message and may need help synthesizing it all in their heads. For example, when we help programs that serve children in the foster system, some children may wonder if they too could end up in the foster system. They don’t always know how to articulate these questions, or are afraid it will sound “dumb.” Opening the lines of communication to talk about the project and share your thoughts can help draw their feelings out of them. Once your kids get a little older, closer to preteen age, they’ll get even more out of the volunteering as a family. Not only will they continue to build on the skills and benefits they’ve already developed, they’ll get an even deeper set of problem-solving skills, developing confidence in their own decisions and abilities. We think this is such an important age for kids to be volunteering, that we've started to set up project specifically for kids ages 9+ so they can take on a greater role, as they are here in the picture of a group making dinner for guests of the Ronald McDonald House. While there are benefits of volunteering as a family for all ages, teenagers may just get the most out of volunteering. In fact, there are so many benefits, and it’s so important, that many high schools or clubs require students to have a certain number of volunteer hours to graduate. Volunteering will help your teenager develop critical thinking skills, and how to communicate with people at all stages of life and levels throughout the community. Through this, they’ll learn new skills that they can apply later in life. For example, communication skills built while setting up a volunteer time slot can help when they start to apply for jobs. Or, a more hands-on example may be that volunteering to help build houses will give them skills they can use later when their own apartments or homes need minor work. This gives confidence of self sustainability, while also confidence that they can make a difference to others. Even thought we are big advocates of volunteering as a family (even across generationsAn important part of volunteerism as a teenager is that it’s starting to form the concept that they can be members of the community on their own, not just with their parents. Another benefit of community service for teenagers is that they will meet new people – people they wouldn’t have had the opportunity to meet otherwise. And by meeting those new people, they’ll be exposed to a diverse population, breaking out of their own bubbles, and hearing stories of people who had very different upbringings from their own. Beyond the social benefits to volunteering, your teenager will also gain valuable experience that can only help them when they apply to college, or for jobs. There are certain scholarships that are specifically given to student volunteers. They can put that experience on their resumes forever, which will only give them a leg up in a world where employers are increasingly looking beyond GPAs and direct job experience. There are so many ways volunteering can help your child develop into a responsible, caring, well-rounded adult. However, it can sometimes be difficult to find age-appropriate opportunities. If you need ideas check out our Past Projects page. Or, if you’re in the Greater Milwaukee area and you want to check out Sunbeam Kids, we welcome kids and families of all ages to join the fun. Together, we can give our kids confidence that they can make a difference by lending a little hand! Birthdays at our house mean a special dinner, cake, presents, and time spent with friends and family. A few years ago, we started a new birthday tradition–Birthday Kindness Projects. We didn’t set out to make this a tradition, it just sort of happened. My son, who was five at the time, was sitting next to me as I read an email from the organization charity: water. I told him about people who donated their birthdays to charity: water instead of receiving presents. This seemed like a tough sell to a five year-old, but we talked about the idea of raising money for charity: water in honor of his birthday. He was on board! We read about communities who have been helped by charity: water and talked about what life would be like if you couldn’t turn on the faucet to get clean water. We sent emails to family members and asked them to donate to his campaign. My husband and I donated, and our three year-old contributed some money from his piggy bank. He raised $238.45 that year and helped bring clean water to a community in Ethiopia. What started as a whim, has evolved into a family tradition for the four of us. The person celebrating the birthday chooses a charity kindness project, and each of us contributes an amount of our choosing. Wallets and piggy banks are pulled out, and I’m always touched by my kids’ willingness to give. We all choose our own project, something that we value or feel connected to. My son did a food drive for his fourth birthday after doing a similar project with his preschool. He took the money we donated, went shopping, and then delivered the food to the Hunger Task Force. Last year I chose a charity that supports families with autism in honor of a family friend. We’ve given to hurricane relief, the Humane Society, Donor’s Choose, and three projects with charity: water (my oldest son’s favorite). We were inspired by a Sunbeam Kidsproject at the Guest House and chose them as a kindness project recipient. There are no rules about how much anyone needs to give. You give what feels right to you. And so four times a year, we make a cake, blow out the candles, and do a little something to help others. It’s tradition, one I hope lasts for many years to come. For the past several years we have participated in High Interest Day at Eisenhower Elementary School in Wauwatosa, WI by planning sessions and supplying volunteers to lead groups of 1st-5th graders throughout the day. A major kudos to the planners of this day, not only for the countless hours they spend coordinating a variety of activities for the kids, but because they thought outside the box when they invited us to lead a topic. The first year was a success and we’re about to participate for the third year in a row. As the idea spreads to other schools, we want to provide a game plan to make it easier for others (maybe you?!) to take the lead. Our Mission at Sunbeam Kids is to “To engage kids with the world around them through community service projects so they experience how even little hands can make a big impact when they open their hearts and minds to the needs of others.” And our Vision is “To develop self-confident and broad-thinking children who grow up knowing they can make a difference in the world.” While planning projects and meaningful volunteer experiences for families is at the core of what we do, we are also starting to branch out to offer resources to help spread this message beyond Sunbeam Kids members. High Interest Day is a great way to reach groups of kids who might not otherwise attend Sunbeam Kids projects! Fun Welcome — The kids can decorate a simple bookmark upon arrival that they can take home. This keeps the kids busy while you wait for everyone to arrive. Once everyone is settled they can introduce themselves to the group with name/grade/fun fact to build a sense of community (kids will not all know each other because it is a mix of grades). Discussion — What is a Community? What does Service mean? So, what is Community Service? Why is this important? How it makes you feel to help others, and how you think it makes your recipient feel? If time, ask if any of them have done any projects they’d like to share. The goal is to reinforce that they can make a difference no matter how old they are, and in many different ways each and every day…sometimes big and sometimes small, but all important! Books — While you may not have time to read a book, summarizing the idea of the book “How Full Is Your Bucket?” is a great way to illustrate the concept that ALL of your actions have consequences — whether positive or negative is up to you. You can find more books from our Suggested Reading List here. Pipe Cleaner Flowers — each student makes 2-3 pipe cleaner flowers to keep and save to give out to someone they think could use a pick-me-up (e.g. bus driver, teacher, parent, friend). Fleece Dog Toys for the Humane Society — each child works with a partner to braid 3 fleece strips in order to make a few dog toys each for a local animal rescue or group. Birthday Cards — the kids create birthday cards on construction paper and then vote for where they will go (we always like to give them a voice in the projects so they can feel their impact!). For example they vote on a homeless shelter, Veteran’s Hospital, Children’s Hospital, Meals on Wheels, etc. Personalized Beaded Keychains — the last project we do is one they can keep! We help them make personalized keychains to hang on their backpacks to remind them to have confidence that they can make a difference. We’ve done this through supplying plastic tri-beads (look a little more fun than regular round beads), letter beads, elastic cording and key rings so the kids can put their name or a message on a small beaded keychain. Closing — just a quick reminder of all the good work they did and that they should continue to be “bucket fillers” every day! One Sunbeam Kids mom also led a Sandwich Making project at her child’s school for The Guest House. Here is a link to what you need to do if you want to pursue this as part of High Interest Day or any group project. The above ideas can also work well for a scouting troop or youth group. Hopefully armed with this information you feel like you could volunteer to bring a Community Service session to your school’s High Interest Day. We are happy to offer more information and supply lists for each of these projects, just email info@SunbeamKids.com for more details. Happy Birthday to Sunbeam Kids! 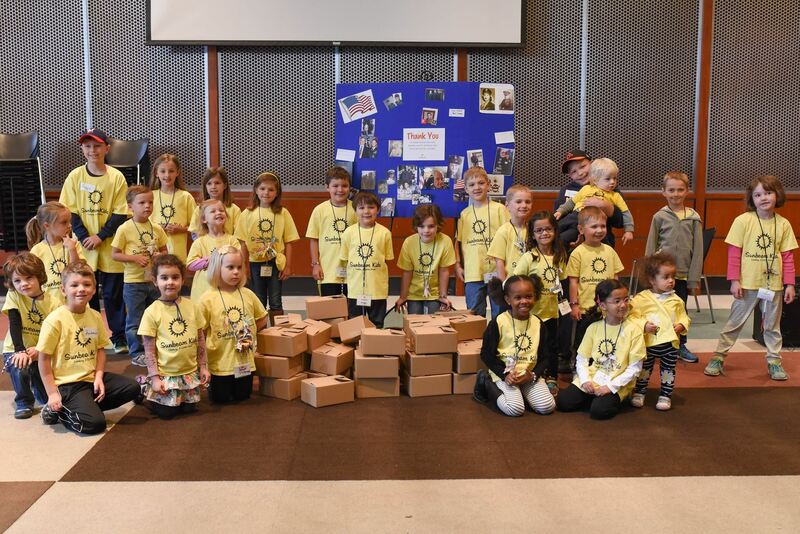 With our September project we will hit the 3 year mark of Sunbeam Kids impacting our community through building in kids that they can make a difference while lending a hand to others. With your energy and support, together we have come so far! You, our families, are what make Sunbeam Kids so special. I also want to thank our fantastic Board of Directors and Advisory Council for all their dedication. lso been careful not to grow too fast to make sure our all volunteer-driven organization is sustainable for years to come. 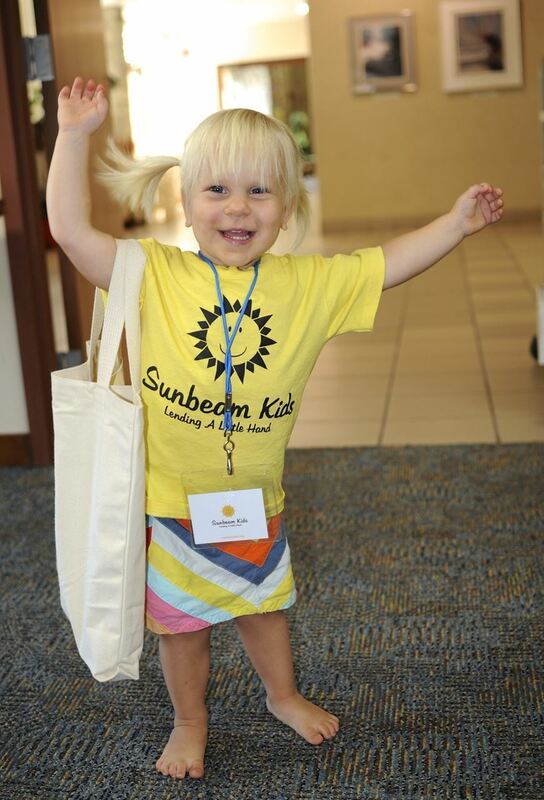 With that said, Sunbeam Kids welcomes everyone who wants to have fun while volunteering as a family. Picked 200 lbs of vegetables for people in need (that is just from 1 of our 3 trips!) at Green Power Garden. 30+ care packages to comfort foster kids on their court dates through Kids Matter, Inc. Hundreds of snack packs with encouraging messages for homeless youth seeking help through Pathfinders. Cleaned up Grant Park Beach picnic area 5 with Earth Love Environmental and the County Parks crew…filled bags of trash to keep the water clean. Made over 350 sandwiches in 2 trips to serve homeless people who are working to improve their situation by staying at Guest House Milwaukee. Brightened 50 senior citizens’ days with BINGO at San Camillo and Congregational Home. Provided nearly 1000 art projects to local homebound and hospice patients with our annual Elves for Elders Holiday Art Collection for Meals on Wheels. Served as a resource and inspired multiple other classes, troops and groups to plan their own service projects. These are just some of the numbers…and the kindness you’ve shown to the kids, employees of recipient organizations and the actual recipients can never be quantified. What has your favorite project been? Do you have a favorite memory from a Sunbeam Kids project? We’d love to hear from you! A sincere thank you to everyone who has made this vision a reality. What motivates you to take the time to volunteer with your family? For some people, the idea of volunteering is relatively new, but for others it is second nature — it’s just a part of how they grew up. Either way, we’d love to hear about how other volunteers have helped shape what you are doing with your family now that you’re in charge! The common theme in all these stories is that each of the “older generation” were not necessarily even trying to teach their kids the value of volunteering, but with their selflessness they led by example and exposed their kids to the value of lending a little hand to help support their community. And what an impact they made! Who has inspired you, and why? With your permission, we will share a summary of your stories in a future post. No need to share names or personal info, but we’d love to honor those who have set the foundation for all the good work that continues today. Please email info@sunbeamkids.org today with your story, and check out our upcoming projects or learn now to join the fun! Our Sunbeam Kids projects are somewhat like this. When we come together we are choosing to make a positive difference. We’ve talked before about how we will never tuly know the impact we have on individuals in our our community. But something is happening that we just have to share. There is a ripple effect starting to happen and we are thrilled to play a little part in it. We are getting more and more inquiries about how people can connect with some of the organizations we’ve worked with, or how they can connect their school, neighbors, scouting troops or even use birthday parties to bring the community together to benefit others. The funny thing is, we know that when we come together to help others we also get so much out of it! You may not be participating in or planning a volunteer project most days of course, but that ripple effect still holds true in all that you do throughout your day. If you need a little inspiration, watch this short video about how little acts of kindness ripple and touch so many people. Also the book Ordinary Mary’s Extraordinary Deed on our reading list is a great book for kids on this topic! Who has inspired you? Let them know! What kind of impact will you make today? Join us to lend a little hand! Visit sunbeamkids.org to learn how you can get involved.